Join us during the day at our tree-lined outdoor location (1820 Flushing Ave) and don't miss out on 'Variance at Night' at House of Yes. 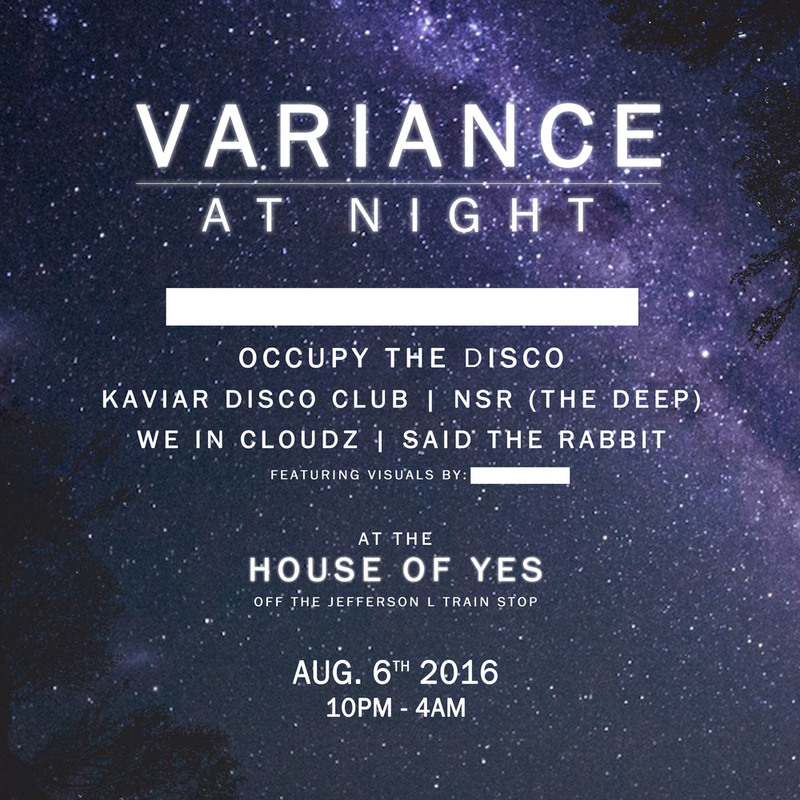 As the sun goes down, Variance at Night takes over the neighboring House of Yes (2 Wyckoff Ave) featuring a selection of NYC's finest locals with special house legend guest Roy Davis Jr. Tickets are limited - to attend purchase the Day + Night ticket bundle above. Variance at Night is 21+ only. Leave no trace. Don’t litter. Respect others, the dance floor and the art. Be mindful, open and present. Stay hydrated, vibe constantly, spread love and revel in the sun. All tickets are sold via Eventbrite. Day of, pull up your ticket on your phone via Eventbrite's App or bring a print out to expedite entrance to the festival site. We are strictly 18+ during the day and 21+ at night, please bring a government issued ID or passport. Variance Festival is a rain or shine event. We have a large tent as rain contingency. There will be no refunds due to rain. In the event of rain, we also advise to bring ponchos, rain boots & umbrellas. In the event of sunshine, bring your sunglasses, a hat, sunscreen, a picnic blanket & floaties. Variance takes place in a lush, private park, conveniently located 4 blocks from the Jefferson Stop (L train). There is NO parking provided, we advise to use public transportation. Address: 1820 Flushing Avenue. A highly curated, locally driven food & drink experience is a big part of this day out on the lawn. A full list of food vendors will be released closer to the festival date. Regarding beverages, a wide variety of beverages (including beer, wine, and non-alcoholic) will be served. There will be two ATM's onsite. All bars are cash only, so we advise to stack up dollar bills before you arrive to avoid waiting in line! Variance is made possible through the help and creativity of a passionate community of volunteers. If you’re interested in working with us, please email info@cronycreative.com and let us know what position you are interested in: Set Up/Break Down; Ticketing; Beverage & Food Services; or Marketing. All confirmed volunteers will be given a free ticket to the festival, festival swag and lifetime respect.